A young Scottish man has died while on holiday at a beach resort in Bulgaria. Cameron Russell, 20, from Dalry in Ayrshire, died after an incident in Sunny Beach, near the Black Sea, on Thursday. The company he worked for has posted a tribute to him on social media describing his death as a "tragic accident". The Foreign Office said it was supporting the family of a British man who died in Sunny Beach. 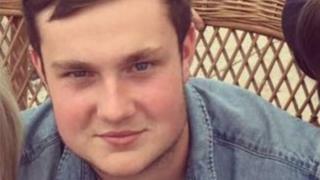 The 20-year-old was a digger driver for plant hire and industrial services firm Clearwater Ltd. In a statement posted on Facebook, it said: "It's with great sadness I have to tell everyone that we lost one of our young digger drivers after a tragic accident on holiday. "Cameron 'Buff' Russell started with the company three years ago and just turned 20 a few weeks ago. "He was a credit to the company and his mother and father. RIP young Cammy, you will be sorely missed." A Foreign Office spokesman said: "The British Embassy in Bulgaria is providing assistance to the family of a British man who has died in Sunny Beach."